The MEDIRAS workshop took place on the 20th of October 2010 in Djerba, Tunisia, including a visit to the first project demonstration plant. Download the proceeding of the event. Five demostration systems have been installed in Tunisia, Spain and Italy. The MEDIRAS newsletter has been published. Please click here to download it. 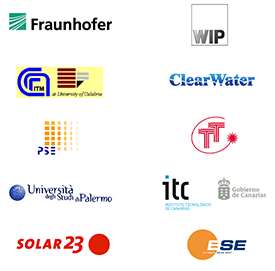 The MEDIRAS project will optimise a solar desalination system and demonstrate its cost effectiveness and reliability. The modular system set-up is based on the innovative Membrane Distillation (MD) technology. MD is favourably applicable for small distributed desalination systems in the capacity range between 0.1-20 m�/day. The technology is very robust against different raw water conditions and is suitable for operation with renewable sources, like solar energy. The consortium will work on developing some auxiliary components that will allow the system to be available for stand-alone application on both inland and coastal locations. The work programme includes the development of scalable system configurations in order to adapt them to different customer demands. Five systems of different sizes will then be installed to supply with drinking water real end-users, demonstrating the cost effectiveness and reliability of the technology. Come back to the website for monitoring the progress of the project and announcements on the project events and site-visits to the demonstration systems. The project started on 1st September 2008 and it will run for 3 years.